A white sofa used to be the first ingredient in a recipe for disaster. Mix in messy children, dirty paws and drippy desserts, and most adults run for cover. Hanging out with the family pooch, eating frozen treats in the once-forbidden living room, building forts with decorative pillows—this is the life of leisure for a child. I am shocked and amazed at the growing number of beautiful indoor-outdoor fabrics on the market — and how gorgeous they are! Woven textures, intricate and graphic looks, trendy designs …much evolved from their limited striped-or-solid forbears. And now for what may come as a surprise to you……..widely available on most everyday indoor sofas, the furniture gods were listening!!! You may find a perfect sofa, but what good is it if you have a family that brings on muddy paws, spilled drinks and everything that come with everyday real life. Indoor-outdoor fabric is made of synthetic fibers, such as acrylic and polyolefin. What’s special is that it’s not dyed like conventional fabric, in which the fiber or the whole piece of fabric is dipped in a vat of dye. 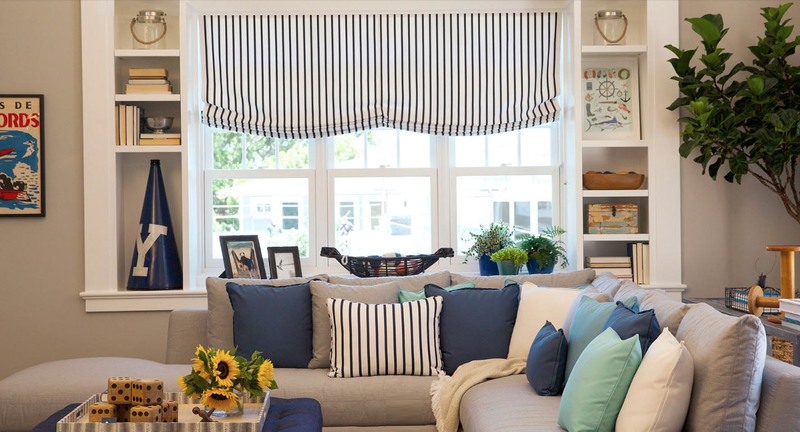 Soft, durable and stain-resistant Sunbrella fabric can help parents create an inviting space that stands up to the nail polish, snacks and school supplies that will inevitably get spilled and strewn about. A whimsical brightly colored wingback chair in this imaginative morning room. It’s fabric now has beautiful choices that you may want it in every room. 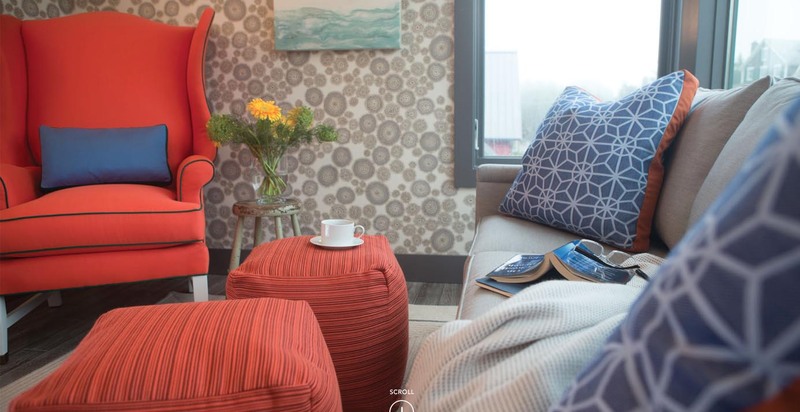 One of our customers asked us this question…..Has anyone had much experience using Sunbrella fabric for indoor furniture such as a sofa? Is it too stiff and plasticky? Sunbrella fabric will withstand the messiest kids and the reddest wines. And, your friends will rave about its beauty, softness and texture in even the most formal rooms. 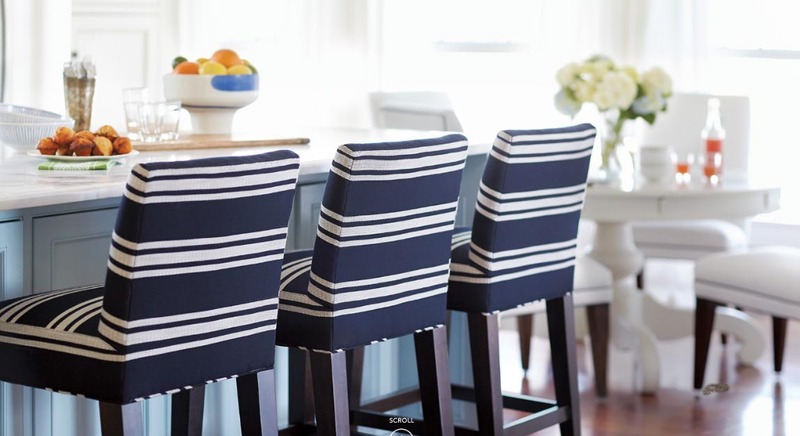 Being the clumsy type, I’d be hesitant to put regular light-colored upholstery on these breakfast bar counter chairs. But indoor-outdoor fabric? You bet. 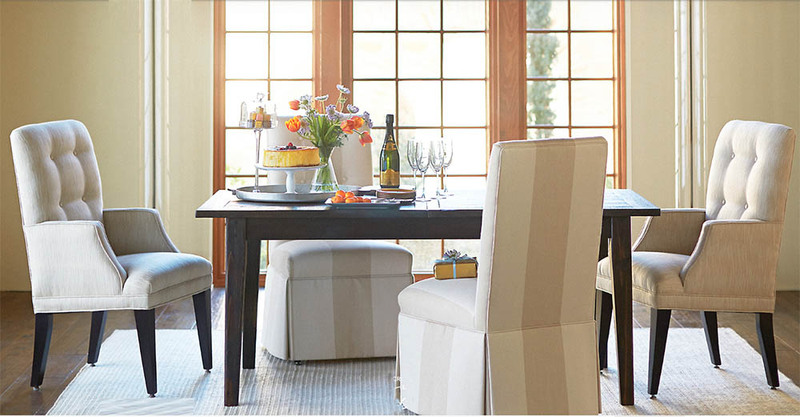 The stain resistance of these kinds of fabrics makes them good candidates for dining chairs anywhere in the home. 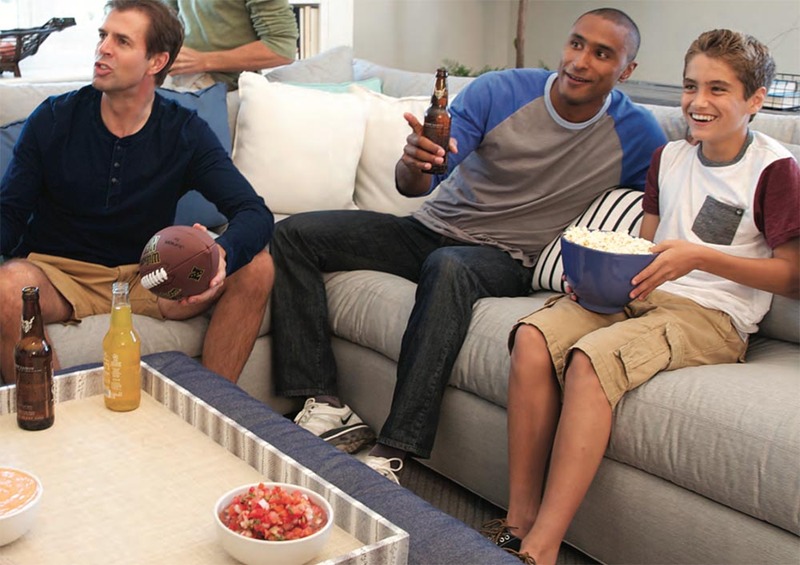 Your living room upholstery will stand up to Super Bowl snacks better if it’s upholstered in an indoor-outdoor fabric like the one shown here. The fabric designs have come a long way, now it can be perfectly used for every room in your home. When you talk with our designers you will discover more styles and gain access to thousands of fabrics that are available. Perfect for catching up on the Sunday crossword or enjoying a favorite glass of wine, the casual elegance of this transitional living space encourages relaxation. At LJE, many of our sofas and sectionals, accent chairs, and dining chairs and benches are available in a huge selection of Sunbrella, and Crypton Home Fabrics. ▪ Apply a light mist of mild soap and water using a spray bottle. ▪ Work the solution into the stain by lightly agitating the entire surface area of the fabric, moving from seam to seam, with a sponge or very soft bristle brush. Avoid scrubbing, and do not use a hard bristled brush or anything that will abrade the fabric. ▪ Rinse the entire fabric thoroughly to remove all soap residue. ▪ Blot excess moisture with a clean, soft towel or sponge. ▪ Blot or wet-vacuum excess water from the entire surface area of the fabric, moving from seam to seam. ▪ Air dry. Repeat rinsing and blotting until all soap residue is removed. For severe stains, see our Stain Chart for removal instructions of specific stains. Soft, durable, and resistant to both stains and odors, Crypton Home Fabric is available on our Huntington House sectionals and sofas. Inquire about a firm’s experience working with Sunbrella fabrics and knowledge of cleaning and re-treatment requirements. 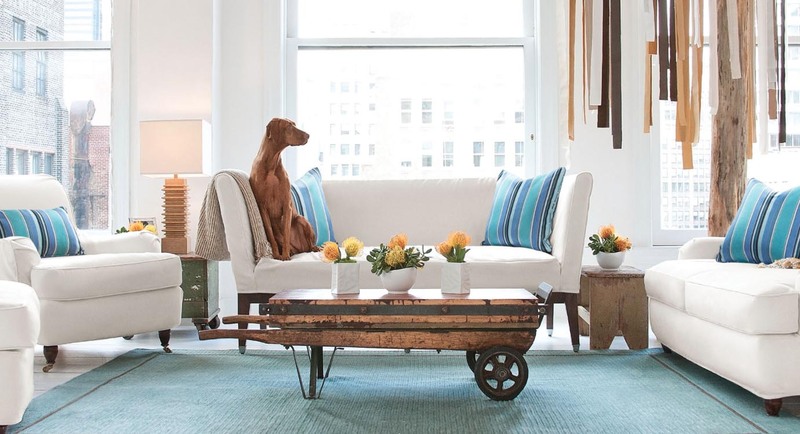 Photos above: courtesy of Sunbrella, and Crypton Home. This entry was posted in Uncategorized and tagged performance fabrics, sunbrella. Bookmark the permalink.